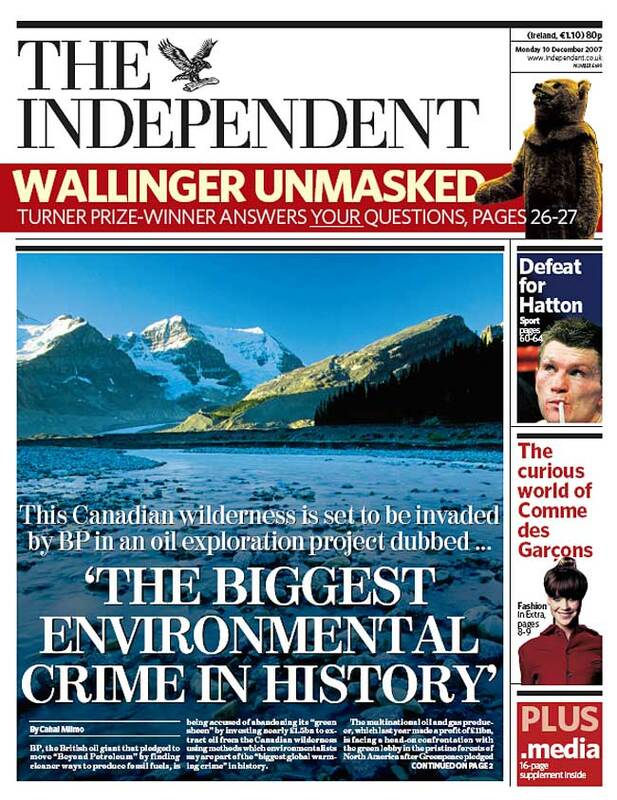 Producing crude oil from the tar sands – a heavy mixture of bitumen, water, sand and clay – found beneath more than 54,000 square miles of prime forest in northern Alberta – an area the size of England and Wales combined – generates up to four times more carbon dioxide, the principal global warming gas, than conventional drilling. The booming oil sands industry will produce 100 million tonnes of CO2 (equivalent to a fifth of the UK’s entire annual emissions) a year by 2012, ensuring that Canada will miss its emission targets under the Kyoto treaty, according to environmentalist activists. The oil rush is also scarring a wilderness landscape: millions of tonnes of plant life and top soil is scooped away in vast open-pit mines and millions of litres of water are diverted from rivers – up to five barrels of water are needed to produce a single barrel of crude and the process requires huge amounts of natural gas. The industry, which now includes all the major oil multinationals, including the Anglo-Dutch Shell and American combine Exxon-Mobil, boasts that it takes two tonnes of the raw sands to produce a single barrel of oil. BP insists it will use a less damaging extraction method, but it accepts that its investment will increase its carbon footprint. BP said it will be using a technology that pumps steam heated by natural gas into vertical wells to liquefy the solidified oil sands and pump it to the surface in a way that is less damaging than open cast mining. But campaigners said this method requires 1,000 cubic feet of gas to produce one barrel of unrefined bitumen – the same required to heat an average British home for 5.5 days. This entry was posted on January 12, 2008 at 5:37 pm	and is filed under Uncategorized. Tagged: alberta, boreal forest, global warming, oil sands, stelmach, tar sands. You can follow any responses to this entry through the RSS 2.0 feed. You can leave a response, or trackback from your own site.